Mum: Who stole the cookie from the cookie jar? Mum (pointing at boy): You stole the cookie from the cookie jar. Mum and Boy (looking at Dad): Then who? I love baking chocolate chip cookies for my family and best of all, love watching them enjoying these cookies. 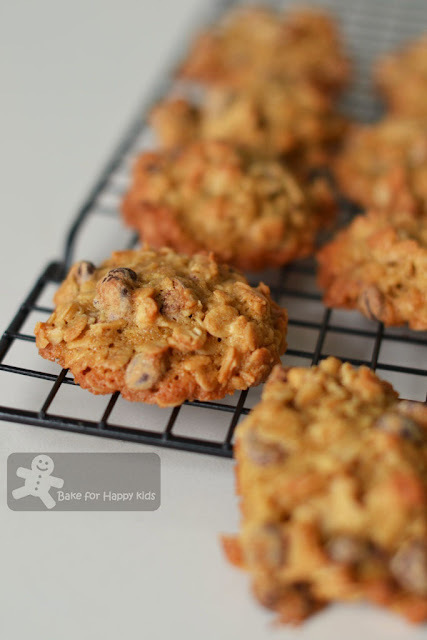 These classic double choc-chip cookies and deliciously wholesome choc oatmeal cookies are baked using the recipes from the book, Bill Cooks for Kids by Bill Granger. 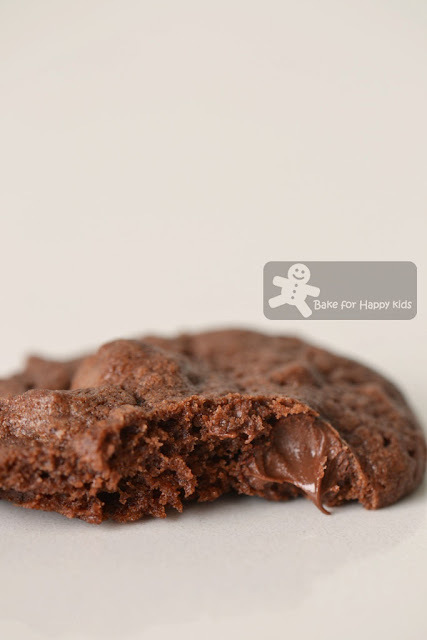 Indeed, these cookies are very kids-friendly and also very yummy. Bill wrote and published this book when his children were little. Every recipe in this book is simple, nutritious, kid-friendly, fuss-free, easy and appealing to kids. Being a mum of a 4 year old, I can't help bookmarking heap of recipes from this book. Plus, my boy is also happily bookmarking this book with me. And of course, his requests include these cookies. Missing cookies? We need a cookie detective! Baking these is so therapeutic! This special choc-a-lot cookie is for my boy! 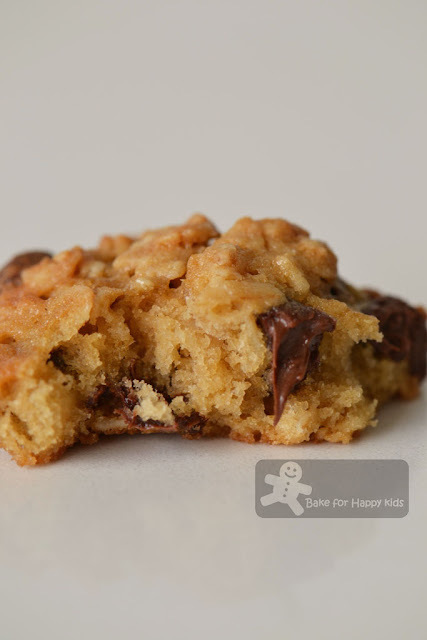 There is lots of oats added into this choc oatmeal cookie dough. Surprisingly good! Crispy outside and melt-in-mouth buttery inside! Not surprisingly at all, everyone loves this classic cookie! 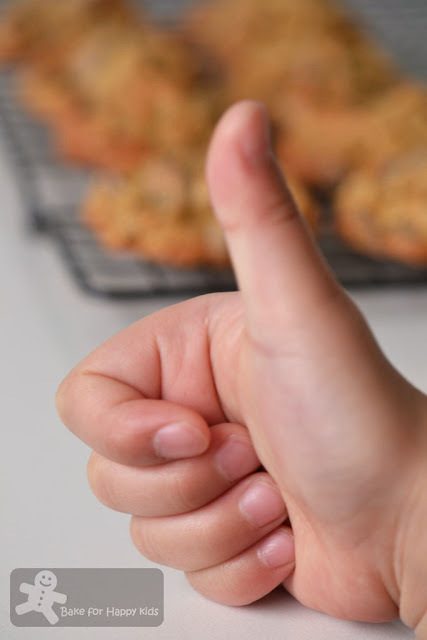 Thumbed up boy: Mummy, can you bake more cookies, please? 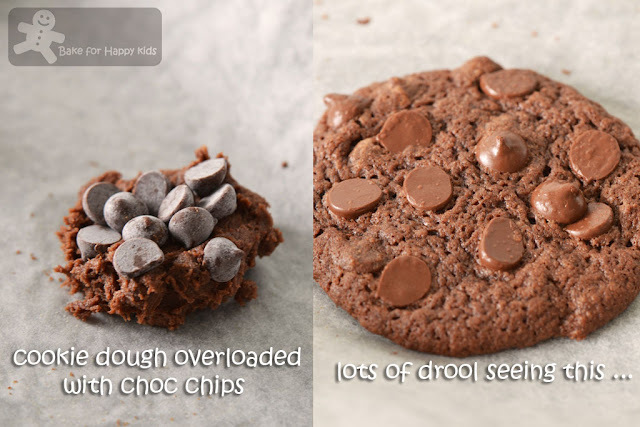 We don't need a cookie detective... A cookie-baking mum is what we need - LOL! Preheat the oven to 180°C (or 160°C fan forced). Grease two large baking trays and line with baking paper. Beat together the butter and sugar until light and creamy. Add the vanilla extract and eggs and stir together well. 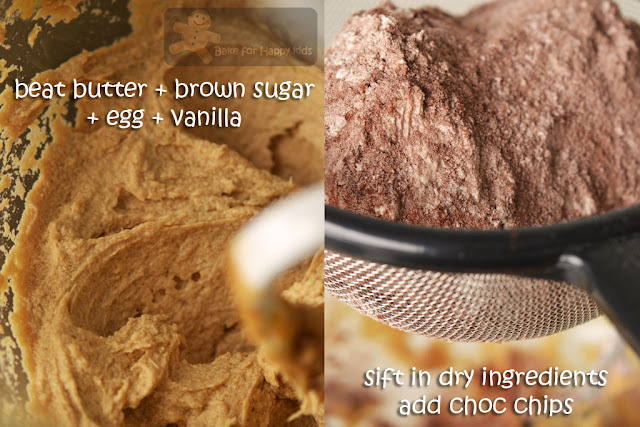 Sift in the flour, cocoa powder, baking powder and salt and mix until just combined. Fold in the chocolate. Place large spoonfuls of the mixture on the baking trays, leaving room for spreading. Bake for 15-20 mins, or until the bases are cooked. Leave to cool on the trays. Note: Using half amount of the recipe, I have baked 30 medium sized cookies at 160°C fan forced for 15 mins. Preheat the oven to 180°C (or 160°C fan forced) and line three large baking trays with baking paper. Cream the butter and sugar together in a bowl until fluffy and smooth. Add the egg and vanilla extract and beat until smooth. Sift the flour, baking powder and a pinch of salt into the bowl and mix lightly. 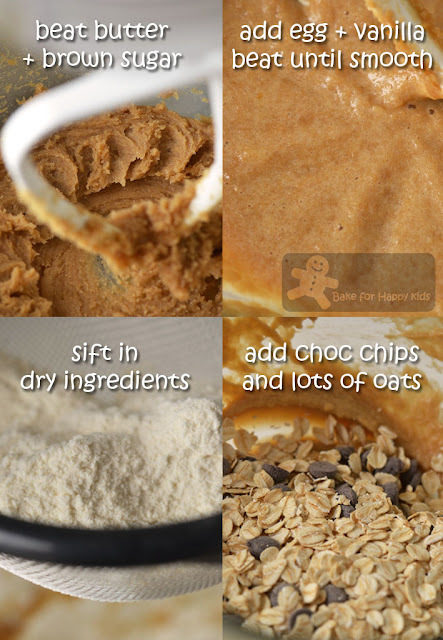 Add the oats and chocolate chips and stir to combine. Roll tablespoons of the mixture into balls and place on the baking trays. Flatten the balls with a fork dipped in flour. Bake the cookies for 20 mins, or until pale golden. Remove from the oven and cool on the trays for 5 mins, before transferring the cookies to a wire rack to cool completely. Note: Using 1/3 amount of the recipe, I have baked 12 medium sized cookies at 160°C fan forced for 15 mins. A family who eats good cookies together, stay together (laugh). Your cookies rock! 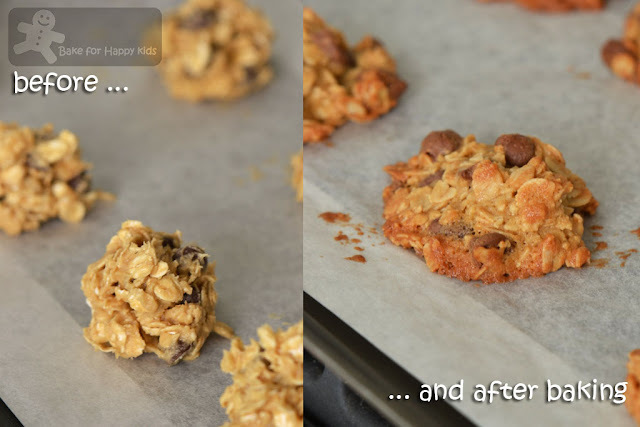 Both with and without rolled oats cookies look very yummy! No wonder your family asking for more! They are indeed Happy Kids! Big thumbs up for those cookies!! Both cookies looks great! 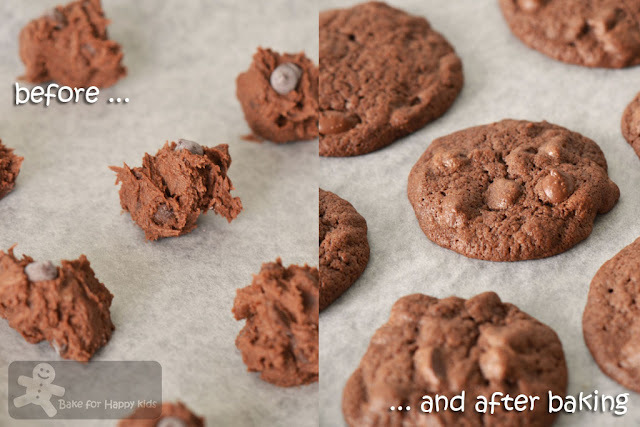 It is hard to resist chocolate, and both these cookies has it! You bake lots of chocolate cookies! 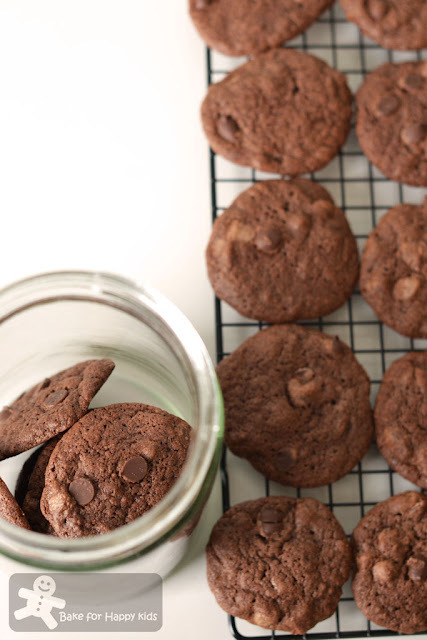 You must be keeping a well-stock choc chips in your pantry, Zoe! These look super chocolately! We have very un-chocolately cookies in my house right now. I love cookies and I think I gain weight just by looking at them! A big thumb up for both cookies! both cookies sound good..the double choc one is really a lovely treat, luxury! Cookie looks amazing!! Can you ship us some Double Choc CHip??? Chocolate chip just isn't enough, it always has to be double, maybe even triple! Thanks for another mouthwatering recipe!